FIFA and France Football have announced that Lionel Messi, Andres Iniesta and Cristiano Ronaldo are the remaining three candidates in the running for the 2012 FIFA Ballon d'Or. The Argentine has netted an impressive 82 goals since January, and needs only three more in 2012 to equal Gerd Muller's record of 85 strikes for club and country in a calendar year. Messi helped Barcelona to the Copa del Rey in 2011-12, while also guiding Argentina to top spot in its 2014 World Cup qualification section. Ronaldo played a key role in Real Madrid's Liga triumph last term with his 46 league goals, and also made it to the semifinals of Euro 2012 with Portugal. Iniesta, meanwhile, triumphed with Spain at last summer's European Championship, as well as winning the Copa del Rey with the Blaugrana. Messi previously won the Ballon d'Or in 2009, while also picking up the prestigious trophy in 2010 and 2011 after it merged with the FIFA World Player of the Year award. Ronaldo emerged victorious in 2008, but had to settle for second spot in 2009 and 2011. Iniesta finished as runner-up in 2010. Vicente Del Bosque, Pep Guardiola and Jose Mourinho have been nominated for the Coach of the Year prize. Radamel Falcao, Neymar and Miroslav Stoch are the three candidates in the running to win the Puskas award for goal of the season, while Marta, Abby Wambach and Alex Morgan are in contention for the Women’s Player of the Year title. Bruno Bini, Norio Sasaki and Pia Sundhage are the trio up for the Coach of the Year trophy in women's football. 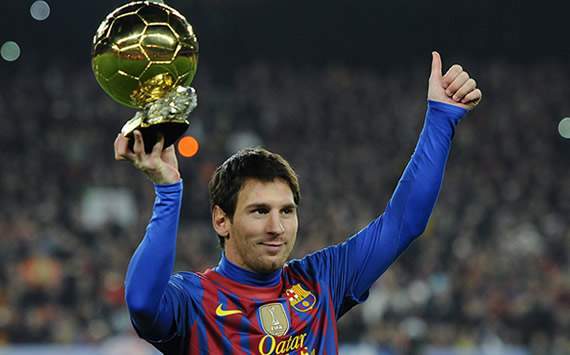 The winners of all of the awards will be revealed at the FIFA Ballon d’Or gala as part of a televised show at the Zurich Kongresshaus on Jan. 7, 2013.